Will eating meat give you cancer? Ready to take the initiative & join our newsletter? 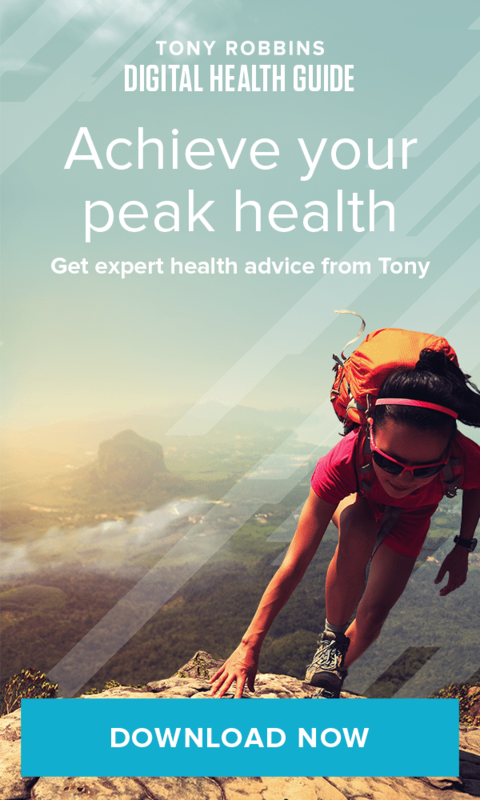 Home » The Tony Robbins Blog » Health & Vitality » Will eating meat give you cancer? When the World Health Organization (WHO) released a report this October linking processed meats and red meats to an increased risk of cancer, the nation stood divided. As a long-time vegan, my mind was already made up — I stood on the side of the fence that felt validated by the WHO’s findings. Humanitarian issues aside, I was already convinced that eating processed and red meats posed serious health risks — a conviction cultivated by reading books like The China Study and growing up in a household that rarely, if ever, allowed for red or processed meat. But there were plenty of others who were up in arms about the news, accusing news outlets of sensationalism and arguing that it was absurd to place processed meat on par with smoking a cigarette. After all, smoking raises a person’s lifetime risk of developing lung cancer by a whopping 2,500%. Could a hot dog or a few strips of bacon really be that bad? Personal opinion aside, I too found it difficult to swallow headlines like “Processed Meats Rank Alongside Smoking as Cancer Causes — WHO” and was ultimately still unclear on the exact relationship between eating these meats and developing cancer. Is it causation not correlation? How do processed meat and red meat cause cancer? Will eating red meat once a week really lead to disease? The findings came from the International Agency for Research on Cancer (IARC), an organization that researches the causes of human cancer and acts as an adviser to the WHO. After prior research suggested that consumption of red and processed meats was linked to increases in the risk of several cancers, the IARC made it a priority to conduct a comprehensive examination on the issue. The IARC reviewed data from more than 800 studies that looked at the link between the consumption of red or processed meat and the risk of certain cancers and was able to conclude that there is sufficient evidence that the consumption of processed meat causes colorectal cancer as well as stomach cancer. They also concluded that the consumption of red meat is “probably carcinogenic” to human and is associated with colorectal cancer, pancreatic cancer and prostate cancer. Though, in both cases, the largest body of epidemiological data concerned colorectal cancer. 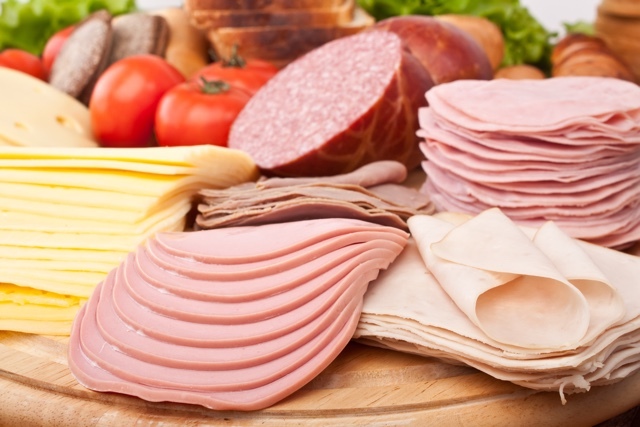 Processed meat refers to meat that has been salted, cured, fermented, smoked or transformed through any other process to enhance flavor or improve preservation. Examples of processed meat include hot dogs, ham, sausages, pepperoni, bacon, turkey bacon, corned beef, beef jerky, salami, as well as any canned meat and meat-based preparations and sauces. Red meat is characterized as muscle meat including beef, veal, pork, lamb, mutton, horse and goat. Red meat is typically darker in color because of higher levels of protein that bind to oxygen, hemoglobin and myoglobin in blood and muscle. The report placed processed meat into the Group 1 category. Other substances in this category include alcohol, asbestos and tobacco smoke, but it is important to understand that they do not all share the same level of hazard. The risk of smoking, for example, is quite greater than the risk associated with eating processed meat. Smoking is estimated to increase the risk of developing lung cancer by 25 times and causes a million deaths worldwide every year. Compare that to a person’s risk of colorectal cancer, which increases by a factor of about 1.1 or 1.2 for every 3.5 oz. serving of processed meat consumed per day. That means diets high in processed meat can be expected to lead to about 34,000 deaths worldwide every year. 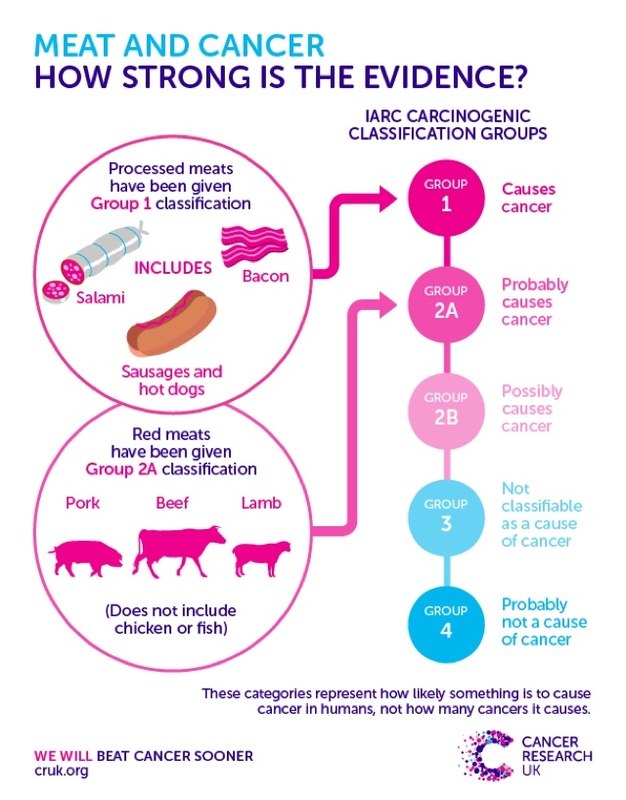 So why are processed meats in the same group as carcinogens like smoke? Because the IARC isn’t looking at risk, it’s looking at evidence. And they are saying that there is sufficient evidence to classify processed meats as a carcinogen. It’s akin to classifying someone as a criminal, but there being dramatically different degrees of how dangerous the criminal is. As for red meat, the IARC classified it as “probably carcinogenic” to humans, placing it in Group 2A. This means that the evidence in humans is still somewhat limited, but there is sufficient evidence in experimental animals of the substance’s carcinogenic nature. Researchers say that the risk of colorectal cancer increases by about 17% with each 3.5 oz. of red meat consumption. Why do these meats cause cancer? 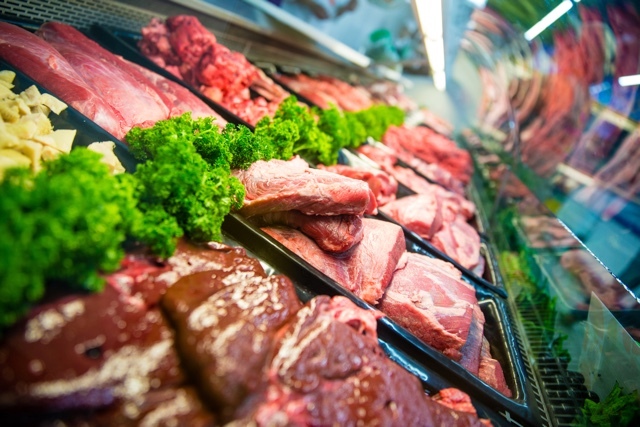 Researchers have found that processing meats can result in the formation of carcinogenic chemicals. The smoking process, for example, may lead to the formation of cancer-causing compounds called polycyclic aromatic hydrocarbons. Also, processing meat often involves using nitrogen-based preservatives to prevent bacterial growth and as coloring agents. Nitrates are particularly problematic, since the body converts them to nitrosamines, which are carcinogenic. As for red meat, one theory revolves around heme iron. Plants contain only non-heme iron, while animal proteins have a mix of heme and non-heme iron. Beef contains the highest proportion of heme iron, with about 69% coming from the heme type. Pork is roughly 39% heme iron. A number of studies have shown that higher quantities of heme iron have been linked to an increased risk of colorectal cancer. Additional research has indicated that the process of digesting red meat could lead to the release of chemicals that produce genetic damage to colon cells in just a few weeks. Cooking methods may also play a role. High-temperature methods, such as grilling, pan-frying, broiling or barbecuing, can form more cancer-causing compounds, such as heterocyclic amines, or polycyclic aromatic hydrocarbons, which are also found in air pollution. While the panel did not offer specific guidelines on processed meat or red meat consumption, its conclusions add support for individuals to monitor and limit their intake. Because even if the risk of developing colorectal cancer due to meat consumption may be relatively small, the risk does increase with the amount of meat consumed. This is particularly pressing since the global consumption of meat has nearly doubled in the past several decades. It is also important to understand that cancer isn’t the only health issue associated with processed meat, nor the most threatening. The Institute for Health Metrics and Evaluation’s Global Burden of Disease study estimates that in 2013, there were 526,000 deaths due to cardiovascular disease linked to diets high in processed meat. The report also showed 84,000 deaths due to diabetes and related diseases, and 34,000 for bowel cancer. That amounts to a staggering 644,000 deaths across the globe that could be linked to meat consumption. To limit your intake, the USDA recommends substituting red meat and processed meat with seafood by increasing seafood consumption to eight ounces per week. Plant-based proteins offer a healthy alternative. Plant-based foods have substantially more antioxidants, fiber and minerals than animal-based foods and significantly less cholesterol and saturated fat. Plant-based foods also tend to be alkaline-forming, which can help your body combat inflammation, reduce stress and protect bone health. Team Tony cultivates, curates and shares Tony Robbins’ stories and core principles, to help others achieve an extraordinary life. Do you want to live longer? Do you want to live to see 120? Get Tony Robbins' articles, podcasts and videos in your inbox, biweekly.